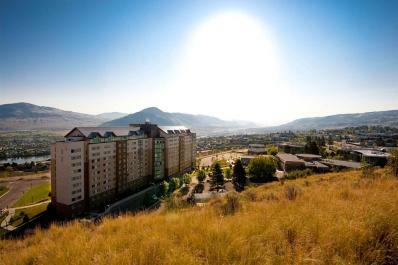 One glance at the Residence & Conference Centre - Kamloops and you know guests there enjoy spectacular views of Kamloops, the Rivers, and surrounding valleys. But it’s not just the view that makes your stay unique. Residence & Conference Centre – Kamloops is an affordable alternative to Kamloops hotels for overnight summer accommodations where guests enjoy high quality service and amenities such as a 24-hour front desk, full kitchens (communal), and laundry facilities. From its central location within easy walking distance to many things to do in Kamloops, attractions, shopping, parks and recreation and the Tournament Capital Centre, the Residence & Conference Centre caters to families, conferences, sports teams, seniors and weddings. When not used as a Student Residence for Thompson Rivers University, the facility has many configurations of rooms and amenities ideal for extended stay guests, leisure travelers, and groups as well. Our summer accommodations are available to the public between May and mid-August and include two and four bedroom suites, private kitchenette, lounges, yoga studio, cardio facilities, multimedia room, business and banquet services, free parking, and more. Residence & Conference Centre - Kamloops also features eight Executive Loft Suites on the 11th Floor with breath taking views of either the Rivers or the Mountains, and they are available year round. Check availability or make online reservations. Contact us by email mparente@stayrcc.com or tbrown@stayrcc.com (just pick one email address). Call for more information 250-852-6296. Description Located on the first floor of the Residence, the Multi-Media room is a versatile space ideal for meetings, social gatherings, sports groups or fun interactive activities. With floor to ceiling windows over-looking the city and access to a large outdoor brick patio, this room offers plenty of natural light and ambience.